being the bottom of the pecking order, the joys of being Top Chook. Day 1: Anzac Day. 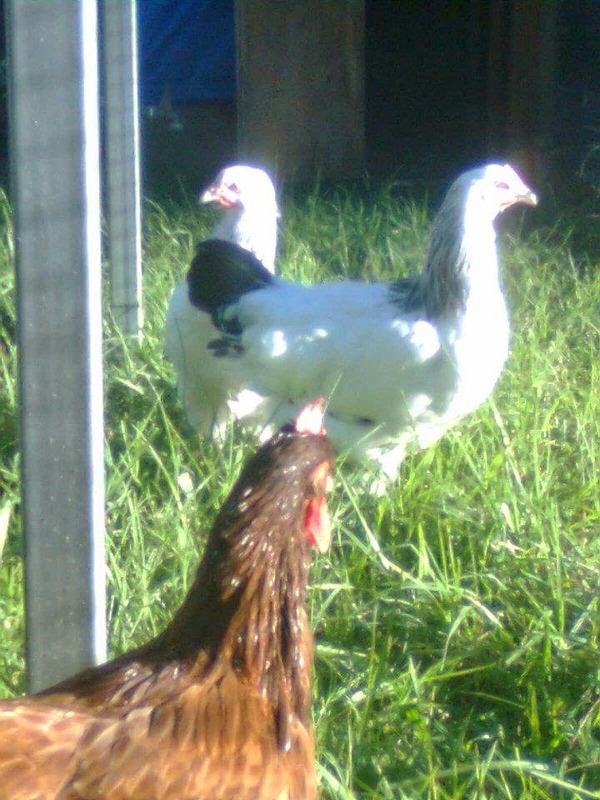 Two very beautiful chickens arrive and attempt, graciously, to fit their new names - Anzac (of course) and The Snork Maiden. They are a lttle overwhelmed by sky, grass, and Radish-the-resident-chicken. Radish, intoxicated with previously unexperienced power, sets about teaching them exactly who is the leader of the pack......or flock. Day 4: "Power tends to corrupt, and absolute power corrupts absolutely" - Radish-the-Resident-Chicken, and erstwhile lowest in the pecking order, now insists on being addressed as "Your Majesty". Day 5: In which Anzac and The Snork Maiden are coming to the realisation that being a chicken at Joyfallee involves a lot of being picked up and patted. They greet this with a mixture of good grace and bewilderment.